Look your summer best wherever you go. The classical form fitting dress adds style and grace to the high end work place, to summer gatherings, business meetings and travel. 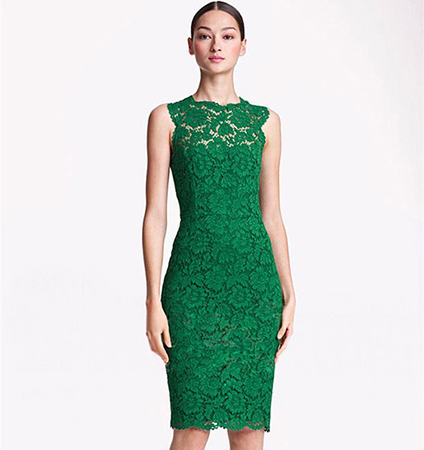 This solid color, flower print lace dress has a matching color lining that begins at the bust and stops short of the lace hem, adding a flirtatious border to the straight, knee-length skirt. The top is sleeveless, with a crew neck and ruffled lace edging. A charming touch is added to the zippered back with a series of flat, satin bows. The dress in available in small to large sizes and a choice of three different colors.